Now we know why Alberich was a troll! "Hass' ich die Frohen! freue mich nie!" A productive way to be. Mendelssohn, on the other hand, was anything but an Alberich. His grandfather was Moses Mendelssohn, an important figure in the Enlightenment. Felix’s background predisposed him to idealism, refinement, learning and improvement. No one committed to such values ever has it easy. Far from being “happy” and mindlessly content, Mendelssohn was a driven man. There are even hints that he was subject to depression quite early on – not at all surprising given his intelligence and sensitivity. Even in his own time, Mendelssohn provoked nastiness. 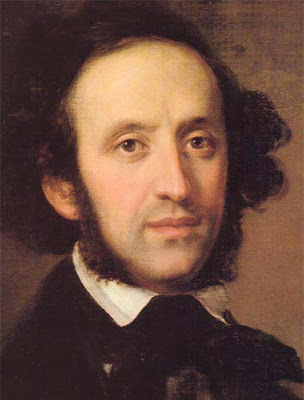 When they were both young in Rome, Mendelssohn looked after Berlioz. But when Mendelssohn tripped and fell down a flight of steps, Berlioz mocked his religious faith. Then there’s the famous incident when Berlioz bullied Mendelssohn into exchanging batons. Except it wasn’t a brotherly gesture. Mendelssohn had to hand over his elegant whalebone baton for an enormous cudgel of lime tree with the bark still on. Berlioz made light of it with a note that among other things referred to “Le mien est grossier, le tien est simple”. Berlioz pretended it was a joke but it was still vicious. Mendelssohn in many ways carried on Enlightenment values. How he would have adapted to the cataclysmic changes in society after 1848, mere months after his early death we’ll never know, but he wasn’t a wimp in an ivory tower as the popular myth might have it. Then along come Liszt and Wagner who defined Mendelssohn primarily by race, not artistry. Indeed, so much of Mendelssohn's bad press pertains to factors other than his music or personality, and reflect more on those who wanted him eclipsed. For some time now, the Mendelssohn Project has been working on Mendelssohn’s unpublished works, as nearly half of the composer’s 770 works have never been performed. Read about what they’ve been doing and their plans to record the lot. We haven’t even begun to appreciate who Mendelssohn really was. Die tote Stadt is Korngold’s masterpiece in the old sense of the word, when a craftsman would produce a dazzling work to show the world what he could do. This is Korngold’s manifesto, so to speak. It displays his virtues beautifully. But his vices, too, are part of the mix. In Die tote Stadt we hear both the promise of his youth and echoes of what was to come. The virtues are clear – this is delightful music full of action and romance. Korngold weaves genres together with ease and freedom. The Meyerbeer segment is a joy. He connects a tradition of popular opera while alluding to the most recent incarnation of the Pierrot story – Pierrot Lunaire, Schoenberg’s greatest hit, a sensation before the First World War. He references Wagner, the Strausses (Richard and both Johanns) and plenty of Puccini, particularly Madama Butterfly, another tale of obsessive love and death. Korngold is no ignoramus. He knows his music history and knows his audiences will relish the allusions. The good moments in this opera are superb, torrents of chromatic colour, sonorities so luscious one could almost drown in their gorgeousness. “O Tanz, O Rausch!” sings Marietta, who loses herself in the ecstasy of dance. This mindless, instinctive surrender to sensuality animates the opera. Marietta symbolizes life and vigour. Only she dares confront the overpowering portrait of the dead Marie. Marie may have her moment of vengeance but ultimately, it’s Marietta who lives on. When Frank, Paul’s alter ego, suggests they leave Bruges, Paul sings a reprise of Marietta’s Lied – it becomes a song of triumph, not regret. The message in Die tote Stadt could not be clearer. Paul must move on if he is to survive. The past can be treasured but cannot take priority over the future. Metzmacher perceptively said that the opera was “like an old photograph. You like to keep it and look at it. But reality is different”. 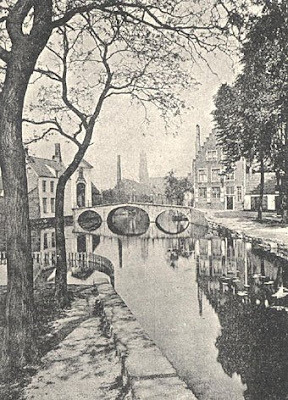 The original novel, Bruges la Morte, by Georges Rodenbach, was illustrated with photographs of the city, preserved forever in one moment in the 19th century. This performance, at the Royal Opera House, under the baton of Ingo Metzmacher, was perhaps truer to the spirit of the original than many others, for Metzmacher sees it as fresh, daring and modern. This is important because Korngold has, in the last ninety years, acquired a reputation for backward-looking sentimentality. Audiences do like what they assume to be tradition. In 1920, Die tote Stadt was cutting edge. Wozzeck and Jonny Spielt auf were years away. There are shockingly daring harmonies and clashes of key, especially in the Prelude to Act 3. Metzmacher’s clear, incisive style doesn’t cloak the modernity in a slush of sugar, but makes us realize just how aware and innovative Korngold could be. Orchestrally this was infinitely more lucid than the Leinsdorf recording, which, while lovely, hasn't quite the pungency to cut through the prettiness. Korngold, like Richard Strauss in Elektra, seems to pull back from the edge. However much his admirers may champion his later work, it is Die tote Stadt that is his masterpiece. There isn’t place in this review for an assessment of Korngold’s career as a whole, but the very fact that he chose this ambivalent narrative is revealing. The libretto was written jointly by Korngold and his father, the domineering Julius Korngold, but this was concealed until 1975. How far did Julius’ arch-conservative hand hold sway over what the son did, consciously or otherwise ? Since the hero’s dead wife holds vampire-like control of his life, the relevance may not be purely accidental. 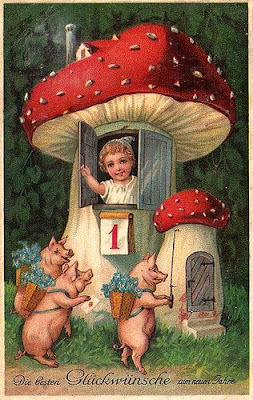 The original novel is far more sinister and disturbing. Korngold instead avoids facing the dilemmas by turning murder and madness into a dream, from which his protagonist can walk away without reflection. Yet reflection occurs again and again in the music and textual images. Willy Decker’s staging makes much of mirrors, portraits, of transparent glass surface that throw light back on the action. The “parallel reality” scenes in Act 1 are excellent as theatre, expressing the ambiguous, multi-layered duality that pervades the music and plot. The procession scene is designed to match the Meyerbeer scene – white costumes, masks, stylized ensembles. This is perceptive for it expresses visually the fundamental contrast in the opera between real life and artifice, between actors and characters. First Night nerves may have accounted for lapses in the singing, though both Paul (Stephen Gould) and Marie/Marietta (Nadja Michael) are demanding roles that keep the singers on stage nearly the whole evening. The range in Marie/Marietta is fearsomely wide, so if Michael was more comfortable in the lower register, it was understandable. Gerald Finlay was luxury casting even though he only appears intermittently. As always, the Royal Opera Chorus was superb. 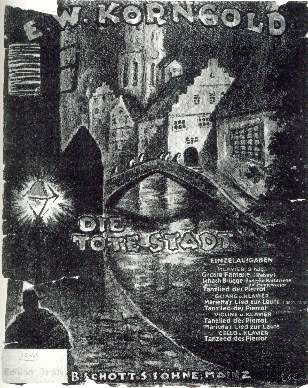 This Die tote Stadt made a convincing case for Korngold’s reputation. Glorious as it is, though, there are elements in it which make us realize in retrospect why the composer would later excel in music for film. Early movies were a kind of “extreme opera”, where music intensified dramatic action, where emotions were whipped up even if the plots were thin. Korngold was writing for film long before the Anschluss, which caught him already in Hollywood. The colourful, episodic nature of Die tote Stadt, with its evocation of feeling, despite the weakness in the text, is a foretaste of where Korngold was to find himself. Only a few years previously, all movies were silent. Film music was the cutting edge of modernity, and Korngold was in the vanguard, creating a whole new genre. Please read the other posts on this blog about Die Tote Stadt, Korngold, Metzmacher and Bruges. There's more on this blog than most places on the net and it's totally original, too. Music of this period, and exilmusik in particular, is one of my special interests, explore a bit on this site. Special requests welcome. 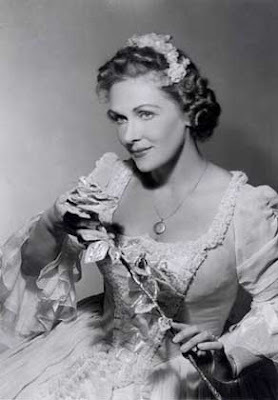 Elisabeth Schwarzkopf is the target of the hate-mobs that poison the opera world. So much so that her real achievements are obscured. This was a woman who was very young when the Nazis were around, too young to have actually done anything to be compromised about. Karajan and even Furtwangler and many, many others have more to explain, but Schwarzkopf is the magnet of all blame. It says more about the haters than the hated. Usually, also, the less people actually know about her work, the more the vindictiveness. Those who know her work and the woman have different perspectives. Matthias Goerne who trained with her and with Fischer-Dieskau, said she was a good influence because she taught him to be himself. Apart from opera, she was also seminal in advancing late 20th century attitudes to art song. If she seems mannered today, listen to singers of the 1920's and 30's. She brought intellectual and emotional rigour to song, particularly needed in soprano repertoire, where prettiness of voice is treasured, sometimes above depth. Living with an egomaniac like Walter Legge must have been hell, but she stuck with him because he did promote art, despite his personality. And if she was tough on others she was infinitely tougher on herself. She knew how much dedication goes into song and had no time for fakes or posers. Here is an obituary written by a singer who knew her. (English translation at the bottom of the page). It's not so unusual as there are others who echo what he says. But it's a reminder of who she was. Here is a clip of her singing Hugo Wolf's Kennst du das Land, still the most achingly wonderful version around. She pioneered the Wolf revival of the 1950's and 1960's although her recordings came fairly late in her career. But they've never been surpassed, even with the abundance of Wolf performance after his centenary in 2003. For the words and translation visit the site recmusic.org on the bottom of the list at the right. In winter all is bare, but suddenly plum blossom unfolds and everything is beautiful. 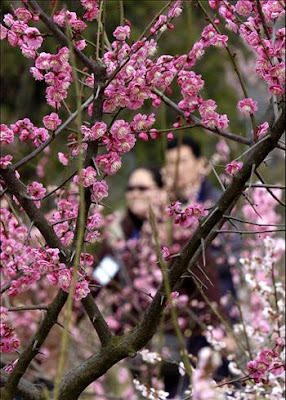 That's why plum blossom is a symbol of the Chinese New Year. People buy branches to put in the house along with other auspicious things like orange trees and pots of narcissus. Sometimes a business will have an entire plum tree - it brings good fortune at a time when all around is gloomy. About a thousand years ago, a poet was exiled south of the Yangtze, in those days to the wilderness. It was not a good idea to communicate with someone who was in disfavour with the Emperor. So the poet's friend sent a bare branch on the long journey south. When it arrived, it burst into flower. So the poet wrote a poem of appreciation for his friend. The Emperor is forgotten now, but the poem, and the friendship it commemorated, lives on. The poem means a lot to me because it was in a collection compiled by a man whose work I was researching. He was maligned savagely by the government of the time, but he did good deeds and had courage. Little did I know that his descendant was someone I went to kindergarten with. So when she gave me his book of favourite poems, it meant a lot. Ingo Metzmacher, who is conducting Korngold’s Die tote Stadt at the Royal Opera House tomorrow, is a specialist in new music – listen to his Henze, Hartmann and Messiaen, and the German series “Who’s afraid of 20th century music?”, one of the best antidotes to the idea that modern music is scary. So why is he conducting Korngold, whose reputation is ultra rich and retro ? 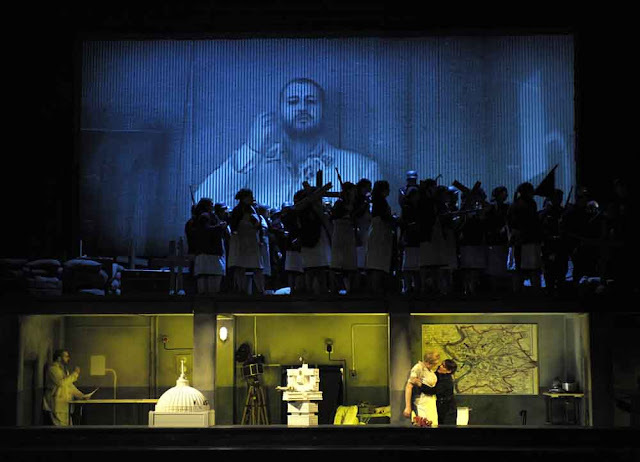 “Because it is a modern opera”, he says “on the verge of modernism….It is like an old photograph. You like to keep it and look at it, but you know that reality is different”. When Korngold wrote Die tote Stadt the First World War had only just ended. Naturally, Viennese minds turned to past glories. There’s a theory that in tough times, people need escapist art. Perhaps that’s why the opera was such a hit, for it reminded people how good the past could be. Korngold built into his music heavy hints that the vision was a “photograph”, just like the illustrations in Bruges la Morte, which are photographs, not drawings. In 1920, Wozzeck and Jonny spielt auf were years in the future. By the standards of the time, Die tote Stadt was ground breaking. As Metzmacher says, it is modern, and Erich made sure the hero moved on. What was Vienna really like in the 1920’s ? From February 28th, the South Bank is hosting a series, Vienna, 1900-35, City of Dreams. The concerts focus on big sellers like Mahler, Zemlinsky and Berg but there was a lot else going on besides. The big names are there to lure audiences to explore deeper and find out gradually about Schreker, Krenek, Eisler, Webern, Pfitzner, Braunfels, Hindemith and others. Plus about the literature, philosophy, art…. And remember Hitler was hanging out too and picking up ideas. There's that photo of him standing in the crowds in the Ringstrasse, and rumours he went to school with Wittgenstein. In any society, there are many different spheres operating simultaneously. Schoenberg may not have grabbed audiences but the ideas he created had far reaching influence. Indeed, it is interesting to compare Die tote Stadt with Gurrelieder. So where does Korngold fit in? Die tote Stadt may be his masterpiece but where does it stand in context of other things going on? where does it stand in relationship to his other work? How does he develop, as people usually do? What is his lasting influence? There will always be segments of the audience who resolutely prefer the past, but what is the past anyway? The inescapable fact is that people often do prefer "the photograph" to reality, fossilization to ongoing life. It would be interesting to see into young Korngold’s mind. He was intelligent, well aware of what was happening around him. But he was also surrounded by conservatives like his father. Mozart rebelled and did his own thing regardless, but Erich Korngold just seems too nice a guy to have done to Julius what Wolfgang did to Leopold ? Perhaps he bottled up his inner tensions. leading to his early death ? Or he channelled his creative needs in a different direction, ie the movies. It’s poignant listening to the Violin Concerto again. It’s famous because it’s relatively easy to schedule (unlike an opera) and is always popular with audiences. It’s instantly accessible because the themes are so familiar. They come from the films, though the films themselves recycled themes he was working on prewar. Kung Hei Fat Choy in dialect, or Gong Xi Fa Cai in Potonghua. Happiness and Prosperity from which all good things flow. Monday 26th is the first day of the New Year in the Lunar calendar, Chinese New Year's Day. This is the year of the Ox, symbol of strength and resilience Useful to remember in these times of turmoil! 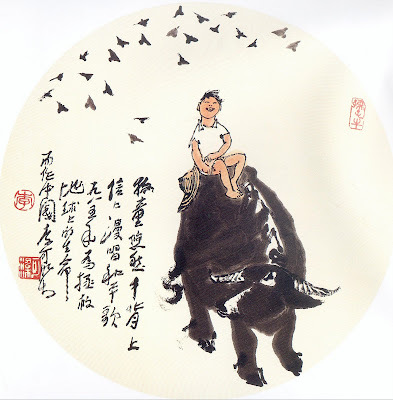 In modern Chinese art the image of a small boy astride a huge water buffalo represents the Chinese people. Throughout history the peasants have suffered but they endure. The small boy is happy, often shown playing a flute. 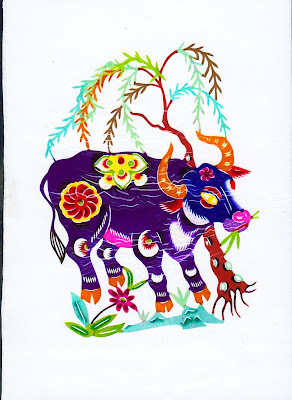 The painting is by Li Keran, who painted lots of these oxen images. Look at the subject list on the right below for more posts on Chinese music, opera, film and culture. Who really was Erich Korngold? We know the facts of his life and lists of his opus numbers, but who was the man, what made him tick? I’ve never swallowed the “more Korn than Gold” epithet. He was no fool, but genuinely talented, and smart enough to know what was going on around him. As a young man he had everything going for him. Music flowed out of him as easily as from a young Mozart. Like Mozart, he had a powerful and pushy father whose contacts could have advanced anyone’s career. Vienna was thriving, culturally. It must have been exciting to be where so much was going on, in so many different circles. This is certainly not to suggest that Korngold “should” have taken on new developments. He moved in much fancier circles than the Schoenberg set and probably wouldn’t have given them much time, even though he worked with Zemlinsky, who obviously knew all about them. But Schoenberg wasn’t the only modernity in town – even Zemlinsky moved ahead: His Lyric Symphony is strikingly “modern” in its own way. Nobody is going to do "new" the same: music doesn’t work in neat little boxes. The current fashion for dividing music into tonal and atonal is schoolboy shallowness. So there’s young Korngold born with a silver spoon in his mouth and everything going for him. Listen to the first two String Quartets and dream of what might have been. Die tote Stadt, for all its high Romantic lushness, has a lot more going for it than the sometimes ultra suss treatments it gets. With Ingo Metzmacher, a specialist in the avant garde, we should hear a much more incisive approach. But if Die tote Stadt is such a masterpiece, where does it lead ? Korngold was only 22, 23 when he wrote it. It was an instant success, so the pressure to top it must have been intense. Hence, perhaps Das Wunder der Heliane, which received a drubbing last year even with a sympathetic audience and Jurowski conducting. So how did young Korngold respond to the pressure ? It can’t have been easy for a gifted young man used to having things go smoothly. Lots of child prodigies don’t go on to be Mozart. There’s nothing to be ashamed of about that. What is interesting, to me anyway, is to try to understand the way things happen and how people develop inside. Having a father like Julius might have been an advantage but it was also inhibiting. The old man wanted things his way and couldn’t deal with Erich marrying a woman who most parents would have been delighted with. Then there’s Erich’s personality, harmonious, accommodating, none of the obsession that seems to drive some composers. The reason I’ve been doing so much on Bruges-la-Morte is that it may reveal something about Erich and Julius by default. Obviously composers completely change their sources. An opera is a whole new work. But the differences are telling. In the novel, Hugues is totally dominated by the memory of his dead wife, who exerts a vampire-like paralysis on his life. Hugues is a creepy loner, living in an emotional desert unpopulated by anyone other than his servant, who leaves him. He doesn’t touch Jane but keeps her like a statue, like the piece of his wife’s hair, in a glass box never to be touched. In the opera, Paul is a reasonably sane fellow who has friends and real life relationships and isn’t nearly so screwed up by religion. In the novel, Hugues kills Jane and goes mad, repeating mechanically “Morte, Bruges la morte”. In the opera, it’s all just a dream. If most of us dreamed of killing a friend, we’d worry. Not Paul, who simply goes on to a new life.Also significant is that Erich and Julius concealed their joint authorship of the libretto for many years. A shrink might think, what's going on? A few years ago, the late Stuart Feder wrote an excellent analytical biography of Charles Ives, examining his relationship with his father and the effect on his creative work. Feder was a child psychologist as well as a musician, so his book is full of perceptive insights, much too detailed to go into here. Interestingly, when Charles retired, as a millionaire, having achieved what his father's family wanted of him, he stopped writing music. Like Sibelius, something held him back just when he seemed to find good conditions in which to work. It’s not enough to blame Ives’s late career on depression, or the Silence of Järvenpää on alcohol. Similarly. it's not enough to "explain" Korngold by simply saying that fashions in music had changed. Korngold’s facility came easily and he was no fool. Perhaps his real achievement isn’t so called “serious” music but in another genre. There still is far too much prejudice about film music. Not long ago a major newspaper ran an article which baldly stated that any composer who wrote for film should not be taken seriously. Evidently written by someone who’d never heard of Britten, Prokofiev, or many others. This attitude hinders a more enlightened appreciation of Korngold’s achievements. Only a few years before Korngold went to America, all films were silent. Music for film was an entirely new genre, cutting-edge modernity in its own way. It was different because music could no longer be through-composed, but instead had to be written in conjunction with film. Sort of "extreme opera". Had Johann Strauss or, for that matter, Wagner, lived into the movie era, they'd have had a ball. Movie music was created to pull heartstrings, not for intellectual analysis, so judging it in the same terms as ordinary music doesn't work. Indeed, it's almost a reversion to the pre 19th century approach to music, that it should be either religious or entertainment, not "high art". Moreover, Hollywood was a lot like the old image of Vienna, only much richer, much brasher, much more opulent. So Hollywood composers, most of whom had known the old world, felt quite at home despite the sunshine and strange customs. In many ways, Hollywood carried on the Vienna image when it died in war-torn Europe. Even Hanns Eisler, surly old communist that he was, wrote music that won Oscar nominations. So maybe Korngold found his voice in a medium other than what his father dominated. There’s a lot about Korngold and about modern music we haven’t yet thought about. Thanks to Operachic (see below and link at right), I've been thinking of Carmina Burana again. Little wonder it's used in movies and adverts –instant arousal, mass behaviour. Which poses the question of how music can be used for different ways. Also about interpretation and performance. As an insight into medieval (and other) life, CB is fair enough. The Middle Ages were brutal. If you were lucky you got high on ergot and died by the age of 40 anyway. Dionysian riot probably meant even more to grim lives. 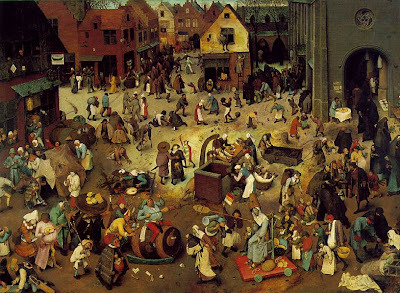 The picture above is Breughel, The Battle between Carneval and Lent. Eat, drink and be merry for Lent is coming and with it, hardship. And you might not be around by Easter. Click on the picture, it expands so you can see the detail. The Greeks and Romans did things like that, too, so there's a context to the yob mindlessness of our times. If Carmina Burana is performed in something like the O2 dome there is no way it's going to be about music and history. A stadium that size means spectacle, mass hysteria, the equivalent of a Party rally with roaring mob and fixed certainty. What people are responding to isn't the music. At least the po-faced "noble" Fischer-Dieskau version doesn't whip the crowds to emotional violence. Medieval people did faith as an escape from chaos and suffering. Lack of inhibition was OK if you could cloak it as religion or the anti-religion of superstition. So imagine an interpretation that goes beyond narrow "Nazi"connotations and opens out the wider context. In many ways it's even more disturbing as it means there's evil in all of us if we aren't careful. There are lots of "nazis" around even if they use different ideologies. The Buddhist belief in reincarnation comes from the idea that we are here on earth to learn from past mistakes. Step on a cockroach and in the next life, you'll be a cockroach. So presumably a bad cockroach comes back as bacteria. Cheer up, back to the Youtube Carmina Burana below. Rush on over to Operachic's great blog on Carmina Burana - link at the list at the right. What a joy to read ! "Carmina Burana, ..... is in fact a purely primitive work. The Medieval origin of the text is just a red herring, its spirit dates from much earlier -- CB's brutality, their unrepentant acknowledgment of God's absence from human affairs, their gleeful endorsement of everything orgiastic make Carmina Burana a splendidly anti-modern, primitive work. " and best of all "Orff is saying that savagery is deeply human. That violence is not an aberration perpetrated by the sociopathic, but it's an integral part of human nature" Read the comments too. Way to go, Operachic, this is incisive and original. And then enjoy then clip below which deflates any self righteousnness either way. Photo is fair use from www.Greenpeace.org whose ideals - support them! On 20th January, the whole world celebrated when Barack Obama was sworn in as President. It’s a historic moment : whatever may happen in the next 4 or 8 years, its significance cannot dim. The old airman had a wonderful wife, who came every day and stayed til the evening, looking after him and my father, too, out of the goodness of her heart. Even in her late 70’s she was still a beauty – they must have been a stunning couple. After the airman’s death, and my father’s, I decided to track down the old man’s story. It was even more remarkable than heroism in battle. In 1945, there’d been a “mutiny” at Freeman Field airbase in Indiana. After serious harassment, the black officers stood up for their rights to enter the Officers’ Mess but were arrested and court martialled. It was a small enough protest but led to the desegregation of US forces, and contributed to the civil rights movement. So today Barack Obama sits in the White House, his place earned by the struggle of thousands before him. Read Lt Col James C Warren’s book, Tuskegee Airmen’s Mutiny at Freeman Field. http://www.tuskegee.com/ Amazon carries it now, but I bought my copy direct from Lt Col Warren who was so helpful and friendly to me, a total stranger.As I was writing this up, I discovered that Lt Col Warren is still around, and was invited to the Inauguration! So there is some good in this world. For more on the "Obama Effect" and black pride, read the other posts on this blog under "Africa" and "Ghana". ! Read the post "Ghana goes gay for Obama" - great music clips and a bit of background why it means so much to all of us, Ghanaian or not. So we think we "know" Shakespeare because we were force fed it at school and can quote phrase after phrase (Alas poor Yorick, get thee to a nunnery, etc etc etc). But it's not the same as really experiencing Shakespeare up close. On 18 January there was a very special production at the Questors Theatre in Ealing, west London – Hamlet performed in the way that actors in Shakespeare's own time would have presented it. It was completely different – raw, direct, vital. In Shakespeare's time, printed texts were limited and few had access to complete scripts. Actors were given their lines with a 3-word cue before each of their speeches. They had no idea who would give their cue or how long the interval would be. They had a short Platt or plot, which gave some detail to stage action and the general direction of the narrative but apart from that they were on their own. In this performance, the cast were called together and sworn not to refresh their memories by reading the play or watching films. As in Shakespeare's time, they didn't rehearse together until an hour before the performance. The result ? Hamlet as a "new" experience, edgy, almost improvisational, but fresh. What fascinated me was the way it threw focus not on illusion of narrative, but on the very process of acting. Since film, we have pseudo realism aplenty, and forget how much art there is in acting. How does a person enter into the spirit of a character who may be very different from himself ? How does he/she express deeper feelings that might not be in the script but can be intuited from how the part relates to the others ? This cast was alert. listening, thinking, feeling, relating what they were doing to what was happening around them. 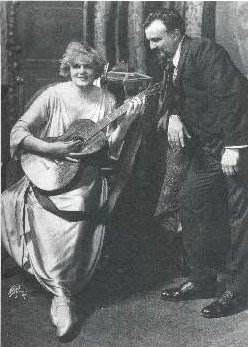 Some of the acting was so natural that the player seemed transformed into the role. For example, Claudius the King. He's a murderer, yet Simon Thomas, who isn't, makes him a rounded, compelling figure. This King has a history – what went on before the action happened ? He's won the queen's love , and he's crippled with anguish, so he's not a simple bad guy. You want to know him better, how he came to where he is. Similarly, Rachel Power as Queen Gertrude keeps us in suspense – just how much was she culpable ? Her love for her son shines through his "madness". As Hamlet himself, Mark Fitzgerald slipped back into "modern" accent but that was good - his Hamlet is all the more convincing as a contempprary figure. There are many real-life Hamlets around these days, and the dilemma is universal. In the small theatre, audience and players are so close that there's an extra layer of intimacy. People may only be a metre from each other, but they inhabit different spheres. That's why doing the first three Acts of Hamlet was such an inspired idea : the play within a play reminds us life and artifice interact on many levels. Hamlet is using the troupe to force a reaction from the King and Queen. He's pretending to be mad to lull their suspicions. They don't know what game he's playing. We all read the script at school, but being up close and personal like this is completely different. In this kind of performance, anything can happen : we participate almost as much as the actors do. What a rewarding experience - I enjoyed it so much ! A “formula composition”, said Stockhausen, was one where a basic idea generated ever expanding forms. Stockhausen’s Harmonien, for example, morphs through different instruments and ensembles. Inori is an extension of Mantra, a dialogue for two pianos. The same basic concept applies, where ideas are passed between performers, examined and passed on for further development. Perhaps all music stems from similar basics, but with Stockhausen, the process is drawn out, so it can actually be witnessed in operation. Inori is full of incident, descriptive and eventful. It’s music that begs for film – if only Stockhausen had written it for cinema! Here, two mime artists mount a platform and act out the “conversation”. Kathinka Pasveer was Stockhausen’s muse, so with Alain Louafi, we were getting as authentic an event as possible. Despite the crisp playing of the BBC Symphony Orchestra under David Robertson, who has a real affinity for Stockhausen, Inori is drawn out rather long, a conceptual experience rather than wholly musical. Even more conceptual was Hymnen. Total darkness in the Barbican Hall, only a projected circle of light at the top of the stage. Was this a symbol of the moon or just a circle of light, like a spotlight without performer ? That’s why Hymnen works so well, for me, anyway. It is a game of illusion, provoking myriad different interpretations. There aren’t any performers as such. The music materializes invisibly, projected from electronic mixes at the sound desk. But what do these sounds signify? We hear snatches of anthems like Deutschland über Alles. Obviously, Stockhausen was no nazi. Perhaps he’s recreating very early memories, for the sound is distorted, fragmented, incomplete. We‘re confronted with our own assumptions by what this music “means”. We forget that the words were written in 1841 and the music is in fact by Haydn. When we listen, we’ve added our own modern connotations. Similarly, Stockhausen throws in snatches of what we recognise as “God Save the Queen”. That, too, has a past life of its own, disassociated from present meaning. Stockhausen then skewers that idea by throwing in the Internationale and The Star Spangled Banner for good measure. They are too well embedded in the music to be simple commentaries on politics and power. Are they “music” at all ? The electronic fragmentation dominates the narrative, such as it is, so the hymns are heard through a filter of unreality. It’s like playing with the dial on a long wave radio, catching indistinct snatches of sound from distant radio stations. Somewhere, someone is listening to a “real” programme, but all you hear, fiddling around with the dials, is what floats around in space on sound waves. Two very different aspects of “listening”. And what are we actually listening to? 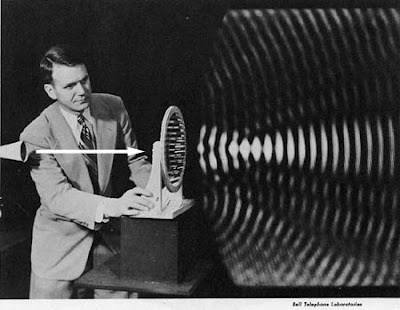 Concrete music or particles of sound circulating through the ether like atoms, accidentally picked up in transmission? For me, that’s why Hymnen works so well. It’s powerfully conceptual, turning the experience of listening on its head. What we “hear” comes from what we hear within our own minds as we filter what we “receive” and turn it into something we can make sense of. Or not, as the case may be. “We” are the performers, so to speak. Yet again, Stockhausen, despite his reputation for being a control freak and autodictat, shows his subversive, humorous streak. The last part of Hymnen revolves around the sounds of someone snoring. It’s too regular to be anything but a mechanical reproduction, it’s not “real” snoring. Sometimes vast, somnolent chords crash in round the snoring, but it remains unchanged. Then snatches of Stockhausen’s voice are heard, cheerfully cajoling. Is he trying to wake the snorer ? No chance, this is tape loop, it can’t be changed that way. Personally I loved Hymnen, and came out feeling refreshed. Not so most of the audience, many of whom left part way. But that, too, is the choice Stockhausen offers. Many of the anthems in this piece were played to captive audiences who had no chance to walk out. see all the other Stockhausen posts on subject list at right - nearly every London concert this year. 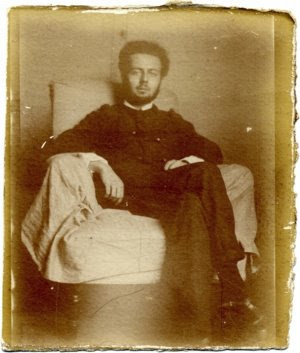 And if you really want provocation, look at the post on Bernd Alois Zimmermann';s Requiem for a Young Poet HERE Zimmermann did Hymnen years before Stockhausen and better. Hugues keeps locks of his first wife’s hair in a crystal box. It never changes, but Jane is getting older. She gets wrinkles, starts having new friends, goes shopping, doesn’t stay passive. So Hugues resolves to leave her. “You’re kidding” she mocks. She knows he can’t face “un second veuvage”. That night he goes home, filled with free floating anxiety. Death seems to have returned, “emmaillotée en linceul dans le brouillard.” The swans, so normally calm, are screaming. It’s a bad omen. intermittente, du chant des soprani. Jane looks round the strange mansion with its portraits of Hugues' dead wife. Then she spots the crystal box with the dead woman’s hair, opens it and laughs. To Hugues, it’s a “profanation”. He’s never dared touch it, all these years. He goes berserk and strangles Jane with her own hair, wrapped around her neck. Jane’s cadaver turns pale, like his dead wife, long ago. Outside, the procession has passed, the streets are empty, silence descends once more. Et Hugues continûment répétait: «Morte... morte... Bruges-la-Morte...» d'un air machinal, d'une voix détendue, essayant de s'accorder: «Morte... morte... Bruges-la-Morte...» avec la cadence des dernières cloches, lasses, lentes, petites vieilles exténuées qui avaient l'air--est-ce sur la ville, est-ce sur une tombe?--d'effeuiller languissamment des fleurs de fer! Bruges-the-dead, cut off from the sea, the waters in its canals turgid like the blood in dying arteries…a surreal city of silence. In the novel, by Georges Rodenbach, a man called Hugues Viane has lived in limbo since his wife died five years before. Nothing is changed, everything as she left it. He doesn’t even like to move the dust on the mirror. He wanders the empty streets, desolate, numb. Then one day he sees an apparition, a woman with the same hair, the same eyes…. Agitated, he follows her, losing her in the crowd, like clouds hiding the moon. Since his wife died, Hugues had feared music. Even the wheezing, asthmatic strains of a street accordion reduced him to tears. In this city of church bells and organs, Sundays were hell. At last he sees the woman again. She’s the exact image of his wife “Le miroir vit”. It's worth reading - he has a good mind and of course he can play piano, too. The print press doesn't know how to handle blogs. Readership is going online so naturally the dominance of print is declining. How to deal with this ? One way is to copy the idiotic "messageboard"style on online editions. Not long ago one of the big papers ran a poll on whether the Serbian secret service killed Jill Dando (a TV star). No evidence needed, anyone can vote. Once upon a time there were things like forensics, detective work and the judicial system. No more! And the paper wonders why its readership is rubbish? Stephen Hough shows that smarting up may be the answer. Fundamentally there's no difference between a regular column and a blog. Online does not have to mean dumbed down ! Stephen Hough will be performing several times at the Proms 2009 so please follow further posts on him on this blog - click on "proms 2009" or "Stephen Hough" on the list oflabels on the right. Each year I listen to nearly every Prom and have been writing them up for years. Last year on this blog I covered 45 ! So please bookmark thgis blog, subscribe and keep coming back. Not too much dumbed down here, either. In 1919, Austria had just lost a war and an empire. Vienna was plunged into austerity. Then Erich Korngold was invited to a party at which was served a pre-war luxury – roast goose and goose liver paté! As a thank-you young Korngold left the room for a moment and returned with a complete song, with piano accompaniment, which he'd whizzed up in the ante-room. 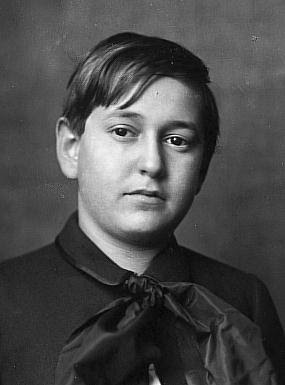 Not a fool, young Korngold (he wrote the poem, too). I'd like to mention a few of my own. your heating system, you wouldn't be stingy with the coal. 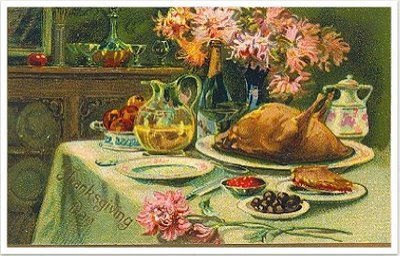 Otherwise, there's a certain danger of catarrh...."
dinner party an entirely, entirely different sort of splendor!" all night with chattering teeth!" thousands of such goose livers!" Now you know why I'm off to Korngold's Die tote Stadt at Covent Garden next week. 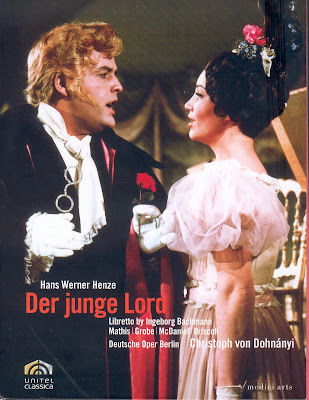 Just released - Hans Werner Henze's Der Junge Lord. It's the 1968 production that's been around on audio forever but now on DVD. The visuals are good for setting context - small town, small minds, stiff cardboard scenery, characters strutting about presenting a public front. Suddenly an English Lord materializes in this milieu where they're always slipping into French. Foreign means good unless it's "too" foreign". The Lord has black servants! The Lord does everything differently. The locals veer from hate to servility. Then one day the Lord's nephew appears and there's an elaborate ball. The young lord is a boorish lout but the locals ape everything he does thinking it's fashion. Note verb. Local beauty is engaged to marry him, thanks to the machinations of her wealthy aunt. As they dance, the young lord gradually goes nuts, rips off his fancy clothes and reveals himself - an ape ! The visuals add a lot. The young lord, the Old Lord's secretary and the beauty's real boyfriend all have grotesque sideburns and hair dyed vile shades of apricot. A hint ? The glory of this opera though is the way Henze writes music in cross currents that cut diagonally across each other - not layers but disturbing, unsettling counterpoint. Yet it's so well woven it's not jagged until the end when pretence can no longer be sustained. The chorus are particularly well written, many voices blending, individuals lost in a mass, but not an organized mob. There's a lot of Henze himself in the English (old) Lord but he doesn't despise the townsfolk, despite their credulity. It's a lovely mixture of ham and high drama. Edith Mathis glows as Luise, her Barbie doll helmet of a hairdo. Donald Grobe is Wilhelm, her worthy lover. They are so sweet, you could squeak ! This is Young Frankenstein long before Mel Brooks. And Frankenstein is perhaps the apt image. The ape sings divine high tenor, almost as angelic as a counter tenor. What has the English Lord been up to ? and for how long ? Libretto by Ingeborg Bachmann. Hugo Wolf, who eked a subsistence from music journalism, detested Johannes Brahms. "The true test of a composer", he told someone, "is this : Can he exult? Wagner can exult, Brahms cannot ". The death of Clara Schumann, and his own impending final illness focussed Brahms's mind sharply. The result was one of the most moving cycles in the whole song repertoire, Vier ernste Gesänge, the Four Serious Songs. For texts, the grumpy old atheist turned again to the Bible. But note how he doesn't revert to pious Biedermeier sentimentality. Death reduces all to nothing. "Mensch hat nichts mehr denn, das Vieh". Status and material possessions are vanity. Like beasts, we all wind up in the same place, as dust. The world is filled with the dispossessed, oppressed by those in power. Then, the next big transition. 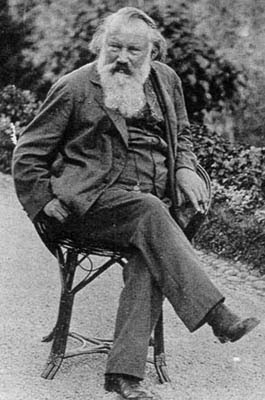 In this final song, Brahms again chooses texts that refer to oppression and suffering, but now making the connection back to the fundamental values that give life meaning. Being able to sing like an angel means no more than being a klingende Schelle (hollow tinkling cymbal). Even "charity" and material good works mean nothing. Then, Brahms takes a sudden leap into another plane. "Wir sehen jetzt durch einen Spiegel in einem dunkeln Worte.... This is the breakthrough, the flash of transcendent insight. All that really has ever mattered is love. The English translation, Faith, Hope and Charity is pretty feeble, for this "love" is infinitely more profound - respect for self, for others, goodwill and dignity - the opposite of oppression, the antidote to the ills of the world). Brahms turns a pious homily into something defiantly radical, universal. At last, Brahms exults! That sums up how it feels to to discover Giacinto Scelsi. 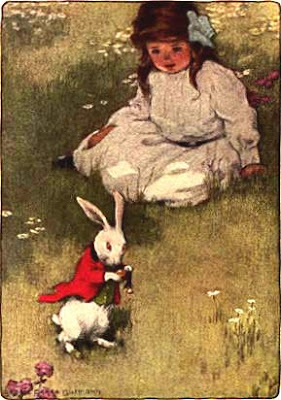 Of course Alice could simply have observed the rabbit's outward features and drawled "Odd bunny, eh ? neurotic, middle aged, urban" and stayed, cocooned and half asleep on the sunny riverbank. Instead she leaps out of "her" reality and enters a weird new dimension. Until I realized I had to forget everything I thought I knew about singing, I couldn't get into Scelsi's Art song. Better to have approached him via some other route (as I later discovered). 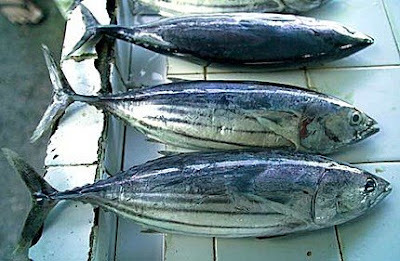 There are three "songs", Sauh, Taigarù and Hô. Say the words together like a chant and hear how they flow into one. Then imagine the chant stretched out, varied, over an hour. Just like Alice's rabbit, Scelsi's universe operates on completely different concepts of time and connection. Scelsi was a mystery. Even though he died barely 20 years ago, there's little information available about him. He's managed to slip through the cracks of modern society where everything seems under surveillance. So here's a link to a very useful article by someone very much on the ball. Read it, this is good writing, no mental blinkers. And here is a free download ! I had another lucid dream. This time I remembered more. It was an extended song cycle which started out as recited narrative, gradually morphing into different forms, like piano/voice, voice with different types of accompaniment, songs without voice but solo instruments (predominantly cello, violin and clarinet) Each time the nature of the text changed, sometimes poems, sometimes prose. Very fluid. Next time I'll have to sleep with Sibelius (the software programme) and notate ! This will make you grateful for a good honest dose of Cantopop ! VBC sing Mou li Hua, The Jasmine Song. Aiya! as they'd say in the vernacular. This clip is better than the other one in circulation. There's also a clip of a big Chinese star singing before Viennese choir and orchestra in the Goldener Saal. But at least they are trying, and recognize that most of the world isn't Austro-German. Which is a lot more to their credit than most in this increasingly anglophone monoculture. Not long ago, Thomas Quasthoff started a recital with a ramble about why he was singing Mussorgsky's Songs and Dances of Death in German. Since that cycle is standard repertoire for bass baritone someone had better tell all the other guys who've been singing it in Russian for years! Specifically, TQ singled out Robert Holl who had sung it and the even more demanding Shostakovich Michelangelo songs the previous week. Holl doesn't speak Russian as far as I know, but he was apparently extremely good (as one would expect from a singer of his stature). So why the fuss ? So much for TQ's theory. Here is a clip of TQ singing in English. And then a clip of Paul Robeson singing the same song. It's so deeply felt. "Ol' Man River...what does he care if the land ain't free...." This is visceral, powerful. It's much deeper than what's just in the words, a whole lot more than a cute tune. "Let me go way from the Missisippi, let me go way from white man boss". That's what the song means : "Ol' Man River, he must know something but he don't say nothing". Robeson is the real article. Singing has a lot less to do with language than with conviction. The Leipzig Gewandhaus traditional New Year's Eve concert transferred to the Barbican, London, for New Year's Day. Major logistics, shifting a big orchestra, two big choirs, four soloists, choirmaster and conductor ! But it was well worth the effort. This was vivacious, punchy stuff, the perfect antidote to the scary forecasts for the coming year. As Beethoven said, "O Freunde, nicht diese Töne ! Sondern lasst uns angeneherme anstimmen und freudenvollere". ie Let's do happy ! This being a New Year Gala, the mink coat brigade were out in force. It's cold between underground car park and cloakroom ! But it was also musically a cause for celebration. Some marriages work better than others, however nice the people involved may be. Chailly and the Leipzigers are a match made in heaven, each inspiring the best in the other, and they are getting better together as time goes by. It's good to hear Beethoven's 9th as audacious and punchy as this. Once, this was shocking "new music" because it integrated song and symphony, using voices to clarify the meaning in the music. The message was so important to Beethoven that he made sure references to it pop up throughout the symphony even in the abstract voices of the instruments. No one who has heard the final movement can be in any doubt what Beethoven believes – he's saying it over and over. The loose translation in the Barbican booklet puts it well. "Let thy magic bring together all whom earth-born laws divide". It's as relevant today as it was in 1823. Snippets of the melody in the finale bubble up irrepressibly throughout the symphony, even in the gloom of the first movement. By highlighting the instrumental detail, Chailly shows how Beethoven moves from solo to tutti, from individual to community. He puts the trumpets up on their own, even above the timpani. So two small instruments make sounds that soar out over the tumult, heralding change to come. Also interesting is the way this approach brings out the character of the small instrumental groups – the double basses, the flutes, the winds. Each is distinctive, like a voice without words – a parallel to the way voices are used as instruments in the last, gorgeous movement. Even then, the trombones operate on their own, reminding us that even in large groups, individual liberty must never be lost. Fabulously muscular, assertive playing . Outstanding was Hanno Müller-Brachmann, the baritone. Watch this guy, he really is good. I first heard him in Mahler's 8th in Berlin with Boulez, where I was seated so far from the male voices that his was the only one to stand out. Listen to the recording where the balance is good. He's still outstanding, and you hear the nuance in his voice. He's doing a Lieder recital on the 8th (Elvis's birthday) at the Wigmore Hall. Pianist is Andras Schiff which shows how well young Hanno is regarded. He is a hunk, too, with dimples even. 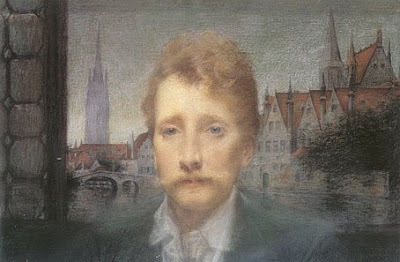 Mörike 's poem was set by Hugo Wolf. It starts with sounds like droplets of ice, melting, or perhaps the twinkling of snowflakes. The descending patterns of triplets evoke the cherub descending from heaven to earth. The cherub's little feet are bare - he doesn't feel the cold, he's an angel ! He's bringing greetings from Heaven to Earth. I couldn't find a picture of cherubic trotters but did find a triplet of trotters. To 19th century people, they signified hope. Hams, bacon and sausages to come, they won't starve in the coming year.